Don’t get too excited, but the chickens may finally be coming home to roost for one of Google’s many data mining platforms, this one commonly known as YouTube. 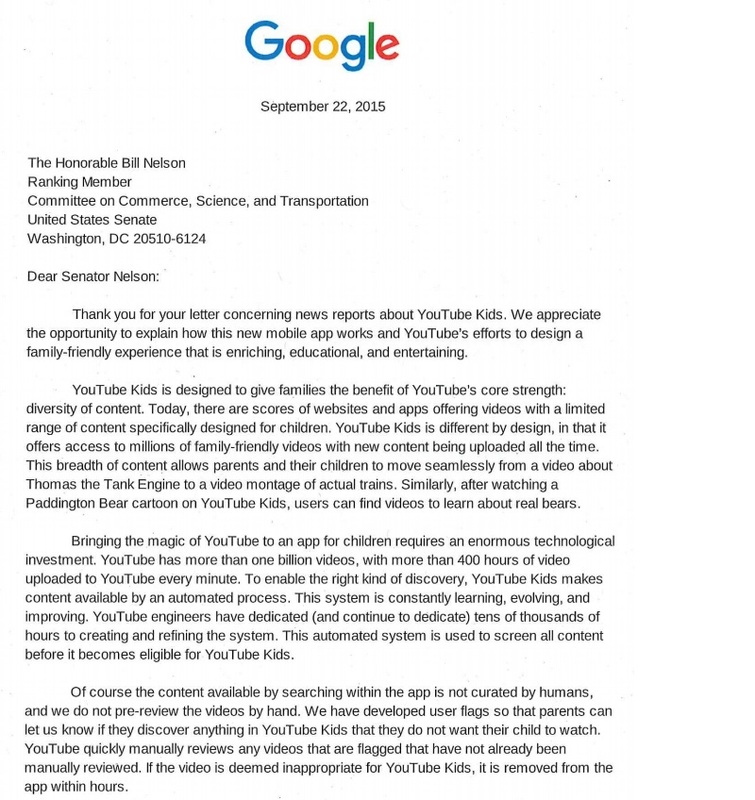 Senator Ben Nelson (D-FL) recently highlighted the flaws in the YouTube Kids app–remember, this is not the web version of YouTube, this is an app expressly targeted at parents of children “five and under”–FIVE AND UNDER. As Senator Nelson describes them: “toddlers”. It must be said that challenging Google’s ability to keep bad things off of their service is also at the heart of Mississippi Attorney General Jim Hood’s questions he asked of Google and for which Google is suing him. So Senator Nelson should feel good that he hasn’t been sued, too. At least not yet. Google doesn’t like it when you challenge them. I would encourage you to take some time and watch Senator Nelson’s video–which is hosted on….YouTube, a fact that should not escape your focus. Hosting videos on YouTube for Members of Congress allows Google almost continual access to the staffs of the Members, access that does not show up on any lobbying report and in-kind donations that are not disclosed to the Federal Election Commission. But here’s the question that Senator Nelson should also be asking. If he’s finding these problems with the YouTube Kids app, has he had a peek at what is available on the web version of YouTube? 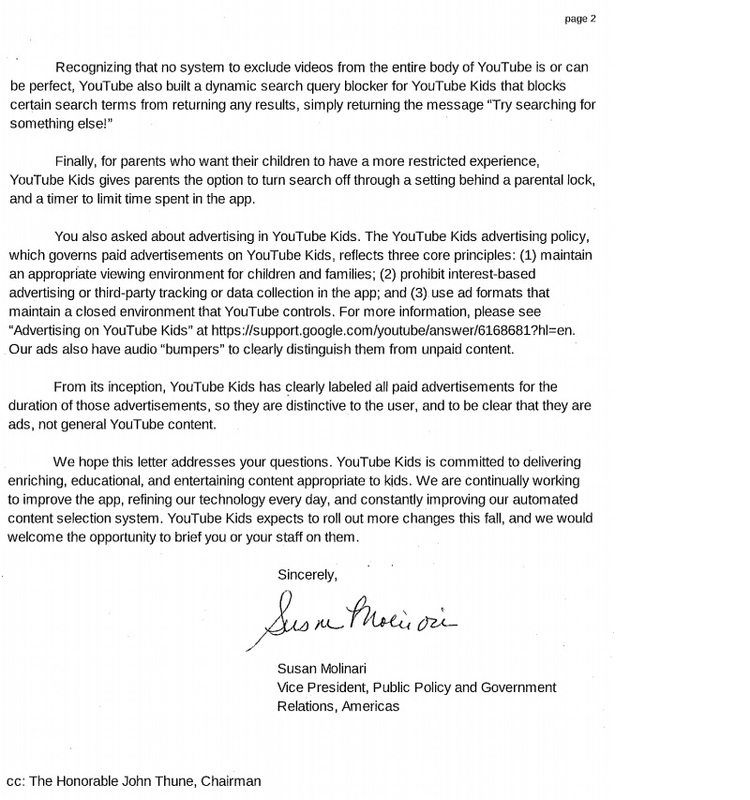 He should, because the reason that YouTube has the YouTube Kids app is to capture an audience as early as possible to transition them to the web version at as early an age as Google can manage it. The better to scrape your data with my dear. And when young users transition from the app to the real thing, they will then be exposed to jihadi recruiting videos, what the ADL calls “bigots who rock,” “how to” shoot heroin in the femoral vein, the HGH community and sugar daddy dating sights. So ask yourself this–what kind of depraved excuse for a human being would enrich themselves this way?